This is a cheerful blue. I’m trying to feel it that way, too. But some days are hard to do. It should be a perfect quiet winter day wherein we can count our blessings by the score. But it isn’t, for reasons of my own. Nothing about anyone else, so don’t worry. I read Anita’s blog the other day and she described this feeling perfectly. I like my small collection of blue. The mug and the candy dish are from friends. One of those friends I hardly ever get to see. If you see this candy dish/this post, I wouldn’t mind hearing from you. 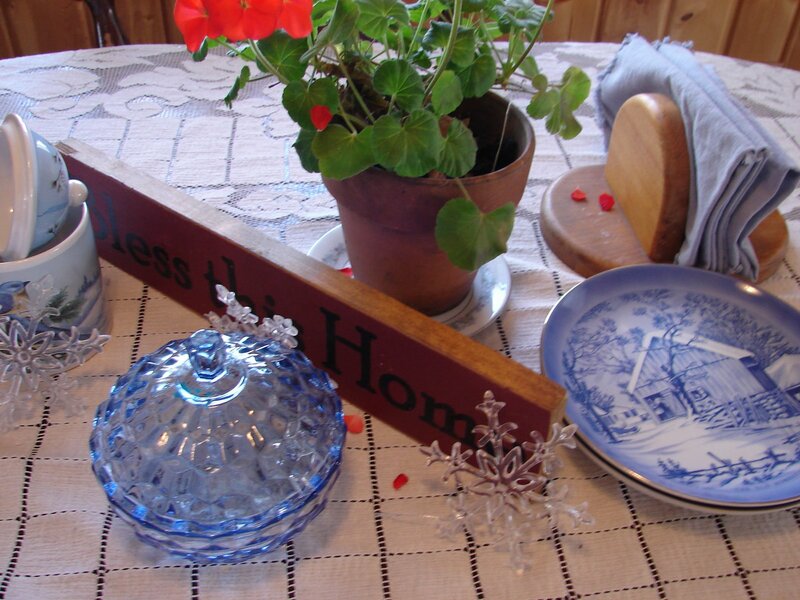 The set of three plates are winter scenes each of three different old homesteads. These plates are among my choicest earthly treasures. The blue cloth napkins were a free collection of 12. And the geranium has been one of four pots blessing us all winter through this cold winter weather. If I could be as happy and beautiful consistently, everyday, in my world, as these geranium are out in our cold porch, I would think I had “arrived”.